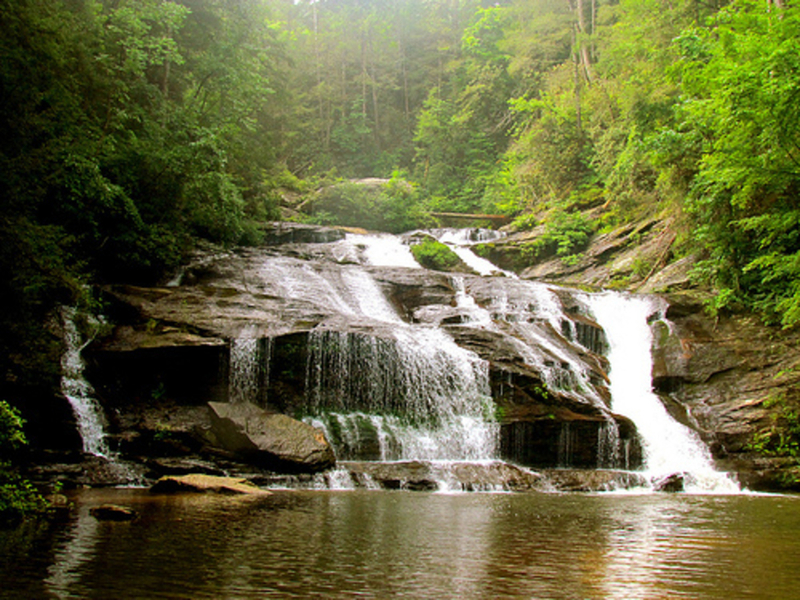 Known as one of the best hikes in Georgia, Panther Creek will take you through lush, green forests and lead you along a serene path to two beautiful sets of waterfalls. This is great for hiking, trail running and camping as well. You will be bragging to your friends about this one! 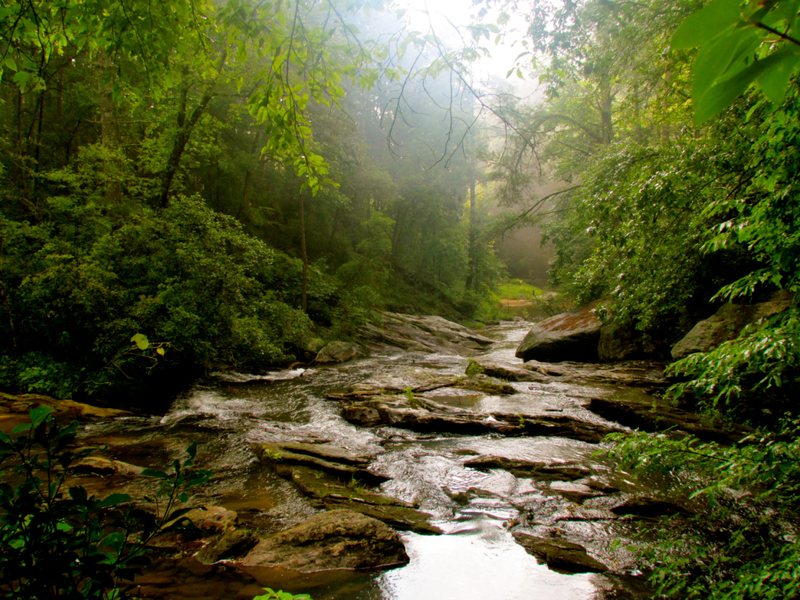 The Panther Creek hike is renowned as one of the best in all of Georgia. Although it is a little far outside the Perimeter, this trail leading you to the two gorgeous sets of falls is absolutely worth the drive. The 7-mile hike is a great opportunity for anyone looking to get away from the hustle and bustle of the city. As soon as you exit your car, you can hear the sounds of the creek below, which is a nice surprise to newcomers, and gets you pumped and ready to go. Prepare for some elevation change, occasional tricky footwork and of course, beautiful scenery. Almost as soon as you embark on the trail, you can spot the creek through the trees down below to your right. For a short while, you'll be making your way through a wooded area, which will then open up and pass beside a small field on the left before passing under two bridges, which is where the highway crosses over the trail. After crossing under the highway, the trail becomes heavily wooded again, and you will be surrounded by tall, mossy trees, bright green foliage, and will begin to feel much more secluded and peaceful. The majority of the trail is not expertly maintained, and many areas are washed out, so proceed with caution. Beware, as this is the part of the trail where you begin to see a myriad of roots, fallen trees, and small stumps around shin level; be sure to look where you're going to avoid getting a nasty cut or taking a spill. The main trail is marked by a green blaze and the many campsites are marked by red. Off the main trail to the right, there is blue blaze that shoots off, which can be found a short distance after the highway, where the main trail returns to the woods. Trek down it for a lovely view of a small, yet beautiful waterfall. This offshoot is short and connects back to the main trail, so there is no need to backtrack. About 2.75 miles in, you will come to the upper falls, complete with a large boulder you can climb on to get a grand panorama view of the area. The trail continues on, hugging the creek at all times, with some small foot bridges along the way. The forest becomes very dense and the walkway increasingly narrow the farther you trek. A little past the 3-mile mark, you will begin to ascend and hear the roaring lower falls before you can see them. Unlike most hikes that take you to the base of a waterfall, this will take you alongside them from the top to the bottom. There are many well-placed handrails in the last stretch, and it is advisable that you use them, as this part of the trail is largely washed out, very rocky and somewhat tricky to navigate. Once you make it down, you will be rewarded with the beautiful view of the cascading lower falls. In the summer, take advantage of the serene pool at the bottom of the falls- it's perfect for swimming and even has a sandy beach. With the shaded tree coverage, it's a perfect spot to set up camp for the night or hang your hammock on one of the many surrounding trees. You will find many locals along this trail, as well as people who have driven hours to get there; this trail is perfect for anyone looking for s little seclusion and an escape from metropolitan areas. Panther Creek is fine for novices, so long as you are in good shape, as it does require a bit of strength and stamina to get through certain parts that are slippery or more technical. Children typically do well on the trail, but be advised that it can be a bit dangerous for them at times, so adults should go first to check the pathway. On the side of Old Highway 441, you will see the signs for Panther Creek State Park. The sign at the trailhead will be visible from the road as well. There is a parking lot across the street, but roadside parking is also an option; it's free and you won't need to cross the street to get to the trail. Be careful of snakes in the warmer months. When hiking or running on this trail, it is best not to go it alone, as most cell phones will lose service about half way through. Also, remember to bring a trash bag and pack all your trash out, as there are no trash cans provided along the way.